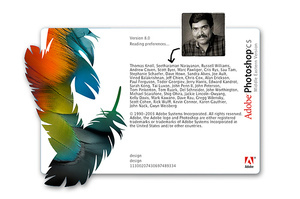 If you use Adobe Photoshop regularly, you probably have noticed an Indian name in the credits when Photoshop opens (like in the picture above - via Hussein Adam). I have noticed that name too ever since I started using Photoshop. Back then it used to be Seetha Narayanan. I am Indian, so obviously I recognized the name. Besides, being the only Indian name on there, it kind of clearly stood out for me. 'Seetha' is a female name (like the eternal Princess Sita from the Indian mythology 'The Ramayana') and I believed that it must be an Indian woman. I think from Photoshop version 5 onwards they changed and put the full name on the credits - 'Seetharaman Narayanan'. And voila now the female has become a male. And from the nomenclature, I am guessing with about 90% certainty that he is a mallu like myself. It is quite interesting how in the US they shorten long Indian names for convenience (like Subramanyam becomes Sam, Sandipan becomes Sandy etc etc). The Chinese usually already have a Christian name attached to their Chinese names. In this case however, the shortening of the name resulted even in gender confusion. For Indians, Seetha is female and Seetharaman is male. Whereas, foreigners can't really make out the difference. I have also experienced gender confusion in some Anglo names. When I heard them first my own thought was it was a he (like when I heard Leslie) but found out that it was a she. Likewise, Gwen who I thought was female(thanks to Gwen Stefani!!) turned out to be male. Another classic is the author Evelyn Waugh who I thought was female, but turned out to be male. So this name confusion works both ways. When I was in high-school and got to listen to the Fleetwood Mac, I thought Lindsey Buckingham was the lead singer and Stevie Nicks was the guitarist. Soon as I dug more into Fleetwood Mac I figured it was vice versa. But in the case of the Anglo names I mentioned above, I'm sure lot of Westerners themselves could be confused about a person's gender on just hearing the names. I could have the same confusion with South East Asian (Thai, Vietnamese, Burmese) or Chinese or Japanese names. Since I am now based in Singapore, this is something that I should delve and explore. How we subconsciously perceive the gender of a person from the first name. As for Seetharaman Narayanan, it seems it's not just me who noticed that name distinctively from other names on the Photoshop credit rolls. He seems to have a Flickr fan club. And Seetha goes on record on the Ironic Sans blog. Why? Because nobody has a name like Seetharaman Narayanan. And he's lived up to his reputation by giving us the best in what Adobe Photoshop can offer year after year. A loud American carrying an opulent Indian saree store bag in orderly Singapore!! Couple of hours back, I was at the post office on Killeney Road, and happened to notice an American lady (who was of course talking loud to the attendant about the big bundle of Christmas cards, gifts and mails she's got to mail home) who was carrying a Nalli (which is a famous Indian silks & sarees outlet) store bag. Quite a random combination of three different elements of person, thing and place. Not to mention the timing of me being there to observe this.